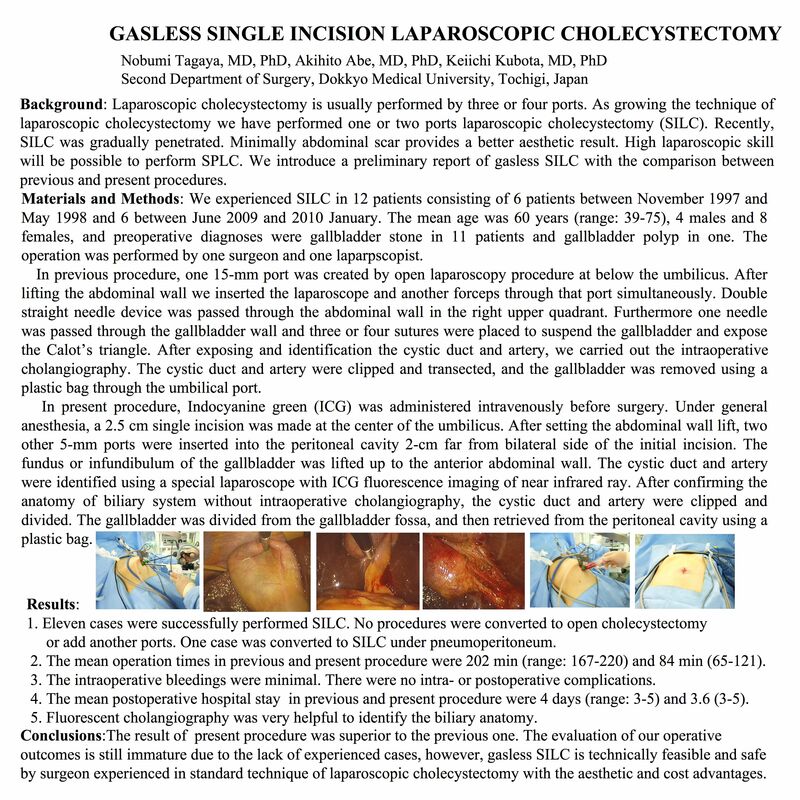 Background: Recently, single port laparoscopic cholecystectomy (SPLC) was gradually penetrated. Minimally abdominal scar provides better cosmetic result. High laparoscopic skill will make it possible to perform SPLC. Methods: We experienced SPLC in 6 patients between 1997 November and 1998 May. Their mean age was 58 years (range: 39-73), one male and 5 females, and preoperative diagnoses were gallbladder stone in 5 patients and gallbladder polyp in one.The operation was performed by two surgeons.Under general anesthesia, one 15 mm port was inserted by open laparoscopy procedure at below the umbilicus. After lifting the abdominal wall we inserted the laparoscope and another forceps through that port simultaneously. Double straight needle device was passed through the abdominal wall in the right upper quadrant. Furthermore one needle was passed through the gallbladder wall and three or four sutures were placed to suspend the gallbladder and expose the Calot’s triangle through the needle hole. After exposing and identifying the cystic duct and artery, we carried out the intraoperative cholangiography. The cystic duct and artery were clipped and transected, and the gallbladder was removed using a plastic bag through the umbilical port. Results: The procedure was successfully completed in all patients. There were no additional insertion of another port and conversion to open cholecystectomy. The mean operation time was 148 min (range: 125-195). There were no intra- and postoperative complications. Conclusions: Our procedure is technically feasible by surgeon with an experience of standard technique of LC attributing to the cosmetic and cost advantages.